(7TH UPDATE) 'The initial investigation shows that the suspected IED was cellphone detonated,' the military says of the blast that hurt at least 33 people MANILA, Philippines (7th UPDATE) – Social Welfare Secretary Judy Taguiwalo clarified on Thursday, December 29, that there are no deaths in the blast at a Leyte town plaza the night before. BEFORE THE BLAST. The plaza before the bombings occurred. Photo by VSU Student Ritchmon Relente. Taguiwalo made the clarification to Rappler hours after Presidential Spokesperson Ernesto Abella quoted her as saying that 10 people were reported dead and 20 wounded after an improvised explosive device (IED) exploded during a fiesta celebration in Hilongos, Leyte, Wednesday evening, December 28. "The info sent to me last night and forwarded to Spox Abella was unofficial," Taguiwalo said in a text message to Rappler. The statement was posted on state-run PTV4's Facebook page on Thursday morning but was taken down later. Abella earlier said that 27 people were reported injured in the blast. First Lieutenant Cherry Junia, public affairs officer of the military's 8th Infantry Division said the IED exploded in the vicinity of barangay Central Poblacion in Hilongos town during a boxing event held as part of the fiesta celebrations in the town. "Initial investigation disclosed that the suspected IED was cellphone detonated," said Junia. Initial social media posts also cited reported deaths in the incident. REPORTS OF DEATHS. At least 6 are reported dead on a social media post. Screen shot from Facebook. At least 23 were brought to the Hilongos District Hospital for immediate medical treatment, the military officer said. 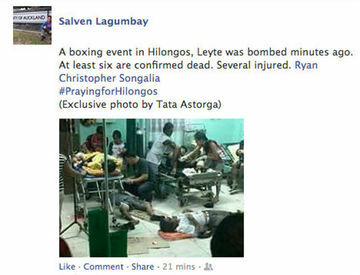 Visayas State University student Ritchmon Relente, who took the photograph posted in this story, said the explosion occured near the tent right before the announcement of the winners of the boxing match. He said a second blast occurred seconds later. On Thursday, December 29, state-run PTV4 tweeted that "at least 19 are confirmed dead" in the incident. 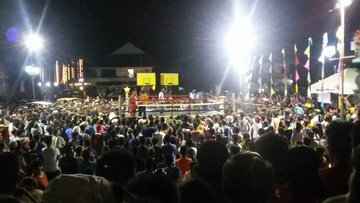 IN PHOTOS: A boxing event in Hilongos, Leyte was bombed. At least 19 are confirmed dead. Several injured. The Philippine National Police Regional Command of Eastern Visayas clarified that based on initial reports it received, there are no confirmed deaths in the bombing incident. "Hindi namin alam saan galing ang report na may patay (We don't know where they got the report that there were people killed)," said Police Chief Inspector Maria Bella Rentuaya, spokesperson of PNP Regional Command Eastern Visayas. A police report said that there were 32 people injured by the blast and were brought to the Hilongos District Hospital. The Department of Social Welfare and Department said on Thursday that as of 5 am, 33 were reported hurt in the blast. The Police Regional Office 8 deployed the Explosive Ordnance Disposal and Scene of the Crime Operatives (SOCO) teams to the crime scene.